Last night I did my last weeknight program and my last Animal Mania! program. Animal Mania! has been on hiatus since the beginning of summer, which was chock-full of bug programs. I hadn’t realized that quite a few of my regulars still didn’t know I was leaving; with the chaos of back-to-school week, I hadn’t told everyone. But I think they’re fine with it. I’ve got one program left before I leave, another Girl’s Club Pajama Party this Saturday! So for this program, I read A Frog in the Bog by Karma Wilson (my newly discovered favorite read aloud author) which was a great rhyme and counting book, Froggy Gets Dressed by Jonathon London which is a classic and a fun pattern book, and Tadpole Rex by Kurt Cyrus which is a new book with great illustrations about a frog who thinks he’s as big and scary as a dinosaur. 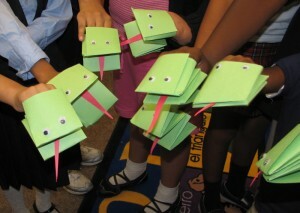 Then we made these simple frog puppets shown in the picture. It was a straightforward, low stress (for me and the tired kids), successful program and craft.